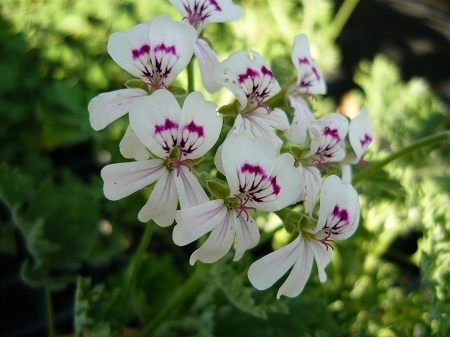 Musk Scented Geranium - Also called Blandford, or Bland's Musk. Deeply divided blue-gray leaves have a refreshing musk like scent. Clusters of small white flowers with red markings when in bloom. Large rangy plant needs plenty of room to grow. Full sun, well drained soil. Perennial zone 11+ Live plant in 3 inch container.